Sometimes, you just need puppies to make life a little sweeter. Fortunately for all of us, we can now celebrate these fluff balls even from our offices. Warning: productivity may drastically decrease. 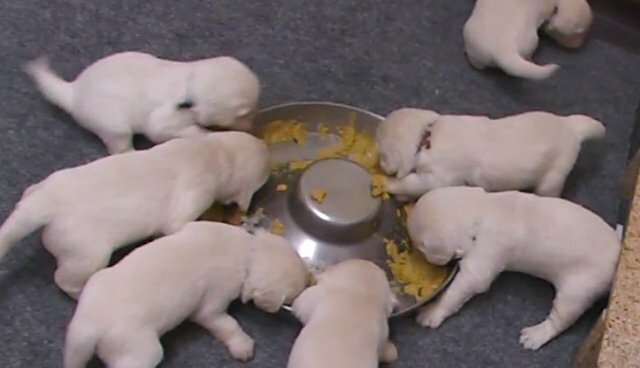 What you are watching: Explore.org's livecam of puppies in Bergin University's Service Dog Program. These Labradors and Golden Retrievers in Rohnert Park, Calif. might be eating, playing or training to be service dogs, depending on what time of day you peek in. Best viewing hours: 8:30 a.m. - 3 p.m. (Pacific Time) Monday to Friday. If the video is not live, click here to view other Explore.org livestreams. Housed at the Bergin University of Canine Studies, these pups begin training to be service dogs as young as three weeks old. Depending on how they do, some will undergo "career changes" and become therapy dogs instead. To learn more about these pups, visit Explore.org. If you want a snuggle monster of your own and are ready for the responsibility, check out ASPCA's website to learn about adopting.